Cardi B thanks for Inspiring me! As we were busy styling up our main table for seating we were inspired... So here goes my story of Inspiration! So those who are not familiar with the rap star Cardi B she has been headlining blogs, news outlets and she was made super popular by her authentic style on Instagram. This young female rapper just recently dropped her debut album and when I saw the cover art I was so inspired. I absolutely love loud colors they scream happiness to me. So with the inspiration of the album art cover, I was inspired to design my recent table scape for our Portfolios & Perspectives Event Design Workshop around the inspiration of the album cover. Searched my mind and took an immediate inventory of items already owned that I can pull this look together. Just a few basics and we got what we envision the color palette that screams fun! 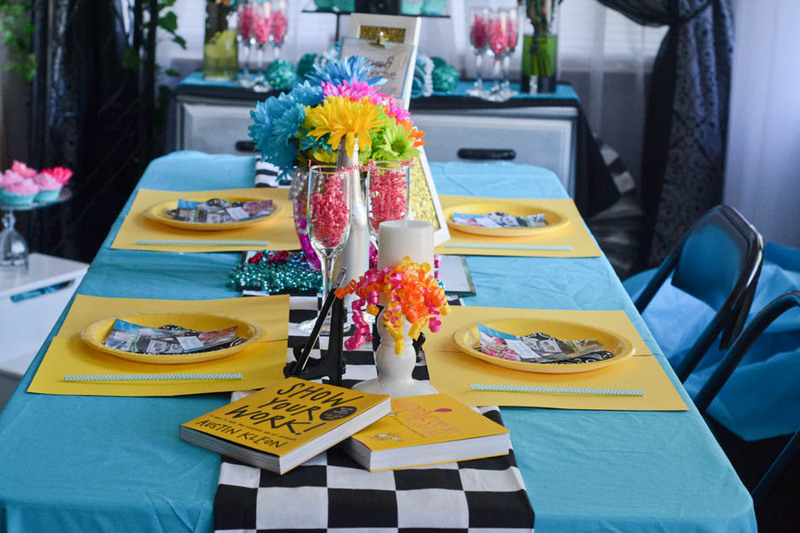 This was a fun table scape to put together! I love lots of colors its screams happiness. Download a Free printable copy here to hang up as a constant reminder of your Super woman capabilities... I am Mother! So we've decided to share a few of our thoughts with you in regards to Head shot photos for yourself and business.. When you visual look at someone or something you already register in your mind the type of person this is whether true or not true about the person and this same holds true with your visual presence on your website or social media platform. Do yourself a favorite and take inventory of your visual content on your platform and make a judgement on what you think these images speak for yourself. Head shot Photography Great Rate Call Now! For me immediately when I see something hand written to advertise a business the first thing comes to mind is cheap. There service maybe not that great.. There signage speaks loudly of the non-investment paid into doing their business. Most times that is what your images are doing for you. Are you a professional and your linked in , Facebook and other social media platform you are using for business are grainy cell phone images or vacation pictures that you have cropped to fit your profile? Do you really want to be that handwritten corner sign and the only way you stand out is because potential clients are looking at you as being cheap. A quality headshot will give you that polished look and feel of what direction you are building your business and your brand. Even if you don’t have all of the logistics together in the business a polished look will attract the right clients and land you the deal. This little miniature beauty is all you need to mix up some delicious treats! This Dash Brand cutie is the closes thing I have to a Kitchen Aide, but it does the trick..
Footsteps all my heart and intimate dinner party with friends it all came about during a visit to Tierra Destiny's consignment shop. We were finishing up our visit and as I was leaving she was telling me that she would love to do something special for her closest friends. Being passionate about creating special events and decor she and I begin throwing out some ideas and just like that we confirm an event just a few shorts months away. The title of the event came directly from the conversation as Tierra was telling me of these close friends that created footsteps on her heart! Eureka!!!! That is it!!! That is the title of the event.. and everything else will represent that!!! Footsteps on my heart, Once the concept of design was developed when then incorporated favorite color palette.This celebration would be like no other because it was truly created from the heart. We decided on a catered sit down dinner. Tierra secured venue and catering from Aj's Catering Atlanta which in the least did not disappoint! Tierra giving me full rain of planning this event! Layout and design with added touches to make the guest feel special. we chose her favorite color purple with cheetah print with a hint of turquiose blue. We announce the event in style with customize party invites! When the day arrives the table was set and a seven course meal was served it was a beautiful celebration of food fellowship and love a few tears were shed as Tierra explained the reason for the day and took time to write each lady a hand written note explaining how and why they place a footsteps on her heart. This celebration to date is one for me to remember due to the heart felt nature of why and how it was created! From time to time we should incorporate small gestures to the people that we love respect and admire and let them know how they placed a footstep on our hearts! Aj's Catering Atlanta- 678.773.3458 View work here! 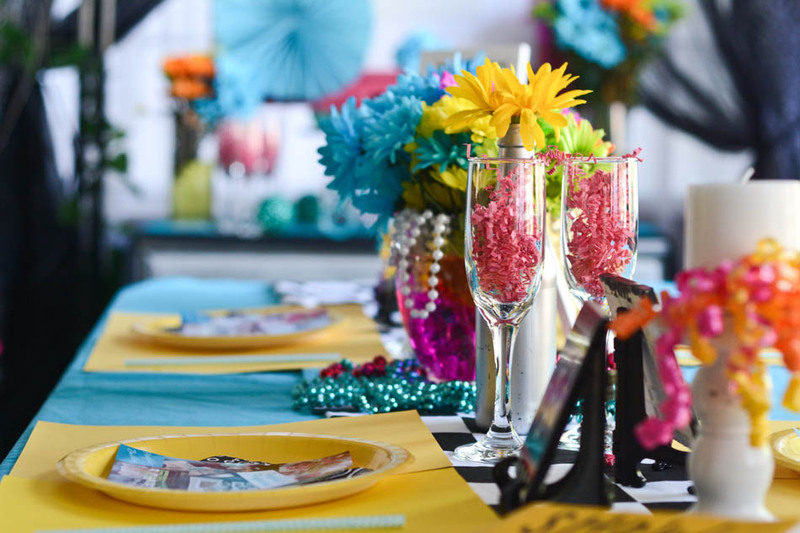 Theme Parties are always a hit! Party Goers get a chance to dress up in character and experience life in the theme of the celebration. What's even more fun is the creation of party supplies that add to the theme. This custom photo booth sign collection was created for an 80's and 90's party! Super excited to create signage with catch sayings for some classic 80's and 90's shows... Can you guess the TV show sayings? Photo booth sign collection Avaliable here!